Our second year into combining the creative efforts of visual artists and poets produced a wonderful evening for viewing the results of those creative passions. Once again, artists provided images to poets to write a new poem, and poets provided poems to artists to create a new piece of visual art. Both were exhibited together so everyone could see the impressions each derived from those inspirations. Many poems were read, and some artists were willing to explain their own process and the emotion involved in creation of their art works. More of an open forum for discussion, we soon found out that our next efforts will have to allow for inclusion of all artists and poets to express the “how” and “why” of the final products produced. We had a few poets and artists who found each other’s work inspiring enough to continue working together, evolving into published works and creative connections: Photographer and board member Karen Elias along with LHU professor, Marjorie Maddox Hafer displayed several pieces together, including copies of Marjorie’s book, Transplant, Transport, Transubstantiation. Poet Jared Conti shared his writing expertise again with visual artist, Sarah Smeltz. We had some new entries, and repeat exhibitors to fill the room with creative energy! work by artist, Tommy Greico inspired a poem by Jared Conti. Those who do work in Williamsport at the Pajama Factory were some of the exhibiting artists and are also there to support their artistic peers and friends! It is wonderful to pull together our nearby communities in order to celebrate the arts. All are standing in front of Tommy Grieco’s piece, ‘Blue”…he is pictured in front. Conversation and explanation made the evening very inspiring… Jared Conti, co-curator (shown at left) helped to bring together an exciting evening of poets and poetry along with the CCAC art exhibit at the Station Gallery. Everyone had a great time while enjoying the works entered by members of the Clinton County Arts Council and the Bald Eagle Art League! Ribbon awards were announced after being judged by Jason Bronner of Lock Haven University’s Art Department. A People’s Choice award was also selected by visitors during the night’s reception, the winner was Christina Smith, “Do You Trust Me?” acrylic painting. Rita Bower and Marianne Olivo. Poets described their process of viewing the art and creating the poem. Steve Bower and Steve Getz in deep discussion! Photographer, Bruce Wallace, contemplating the work of Jackie Thomas! Thanks to board member, Fred Bucheit, for taking photos! Claira talking to LHU Art professor, Raymond Heffner, while people enjoy the exhibit. Claira, left, and Carol, CCAC president to her right. Both received degrees from Edinboro University of PA, and enjoyed sharing memories of making art on campus. Friday night had a great opening reception for Recycled Repurposed Exhibit! MORE DESCRIPTIONS OF FRIDAY'S OPENING RECEPTION AWARD RESULTS! The entire group of artworks were felt to have executed the theme very well, and used the recycled or repurposed materials in a very creative way. Jim Bright gave his congratulations to all the participants. 1st place - PRESENCE! This piece takes over any room that it is in. It has great way of making the viewer smile, and has a great sense of wonder. 2nd place - PERSONALITY! Outstanding use of materials, with a great contrast of theft fabric and the industrial support. The subjects are beautifully handled, especially the contours, sewing and edges. Very skillful and playful. 3rd place - The marriage of materials is wonderful! The "handle" appears as part of the form. This is great mystery about this piece. "I would enjoy living with this work"
4th place- This sculptural wall piece creates great movement... Its subjects use their gaze to move the viewer's eye straight, left, down and back into the work. It leans out to great us! the works of artist, Jessi Moore, fill the Station Gallery with the unique use of glass in her chosen medium...using Pate de Verre. Her Sky and Sea works seem lighter-than-air with the texture of sugar, creating contemporary forms in beautiful soft colors. Make sure you visit the gallery before the show exits on April 7th. CCAC Member, Deb Stabley, wins 2nd Place, BOOKS UNDONE show at Penn College! Congratulate Deb when you see her! Station Gallery will be closed from January 8 - January 31 and don't forget to renew your membership for 2018! The gallery will be open until January 7th, when artists who are exhibiting in the Holiday Show will come in to remove their artwork. We will not have regular hours during the remainder of January so we can clean up the gallery and make any repairs,...plus it allows all of you to keep warm and toasty in your homes! Don't forget to renew your membership for 2018, if you have not done so. We have tons of fresh ideas for events, learning about the arts and fabulous new exhibits coming up for 2018. Be sure to check the website for the new calendar, which should be coming soon. Our first exhibit for 2018 will be opening on February 16, 2018, and will be works from the Lock Haven University permanent collection and student art representing their creative spark from this past season. We are honored to have this collaboration with faculty and students kick off our next year of artistic inspiration and excitement! If you haven't been in the gallery to see the work of Jim Farrah, you can still stop by. Thanks to Fred Bucheit for taking these photos for us! If you missed the opening reception, you must come out to the Station Gallery to see Rich Harydzak's exhibit of large oil paintings done with a vibrant palette knife technique. SHUTTERFLIES 2017 WAS A GREAT SUCCESS! Shutterflies 2017 was very successful and a super creative outlet for our Clinton County students! We have attached a handful of images showing them in action. Many of them completed some excellent final works, using our technology and even used their own cellphones. They also completed a lesson in cyanotypes one day, which gave them a deeper knowledge of the photographic process. Our Instructors this year were two recent Lycoming College grads who are heading off to grad school in California – Emma Daniels as our lead instructor, assisted by Samantha Cutrona. Thank you all again! The students were so enthusiastic and we know that they are anxious to continue their photographic endeavors! Thanks to our generous sponsor, Woodlands Bank! Thanks to all who contributed to making this year's photo show a success: the photographers who entered the show, Linda and Robert Hale who judged, Peg Johnston and Fred Bucheit who helped hang the exhibit, and Fred again who took photos at the opening. Brigandi, Gleghorn and Associates for the 2017 Juried Regional Photo Exhibit. They have graciously sponsored this award since 2012. Judy and Stuart Olinsky also sponsored an additional cash award for this exhibit. Winners of the CCAC/BEAL Combo Show! A great night, full of art, friendly people and insightful commentary by our visiting judges! Thanks to all who entered their artwork, hung the exhibit, provided refreshments and helped to clean up after the excitement was over. It takes a lot of creativity and teamwork - and thank goodness, our community is full of both! Thanks to everyone who selected the Clinton County Arts Council to receive the 2016 "Downtown Appreciation Award" for Community Partnership for the CCAC LHJAMS Fesitval, "for reaching out and forgoing an innovative and mutually beneficial relationship with the Downtown Lock Haven, Inc. Main Street program. So many were involved to bring our dream of a downtown Jazz and Arts Festival to our Downtown! At the December 8th Board meeting, The Clinton County Arts Council held officer elections for the 2017 / 2018 term. Carol Ann Simon Cillo was elected Board President of the CCAC which runs and operates The Station Gallery. 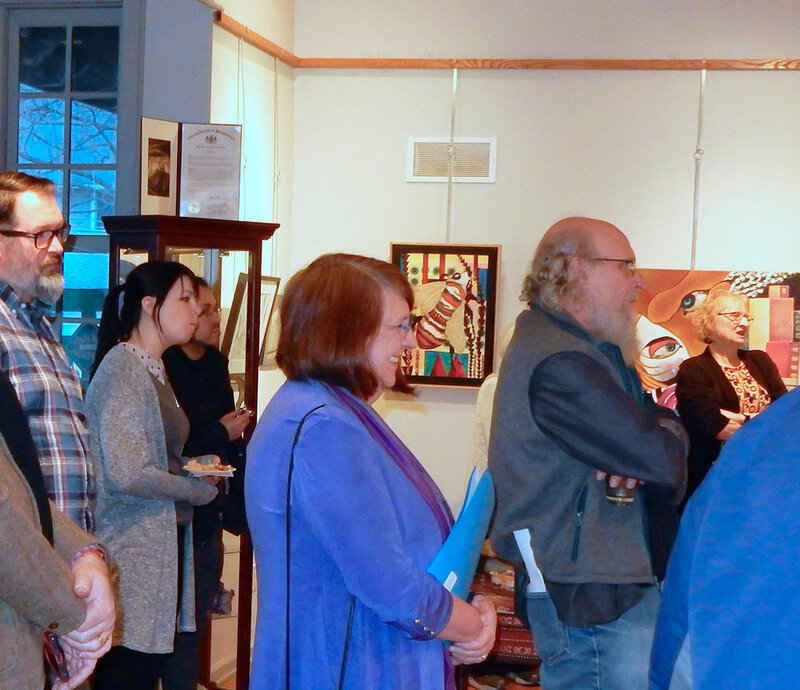 In addition to the gallery, the CCAC has been the driving force within the region to connect and promote the arts within Clinton, Centre and Lycoming counties. Outgoing President Steven L. Getz stated, “Planned change is a good thing and periodically adjusting the leadership roles in any organization creates energy to accomplish new and exciting goals. I couldn’t be more confident in the direction of the CCAC to continue our mission of art enrichment in the region. Carol has considerable experience in leadership roles and we are excited to have her head the board. She brings a rare combination of business and art skills needed to guide the CCAC in the direction the board of directors has outlined over the past 5 years while developing new objectives and strategies for the future. Her business, government and art connections within the region are essential for the prosperity of the organization. She has my total support and I will remain on the board to assist her in any way. By stepping down as Board President, I can now concentrate on several art enrichment projects that have been on hold over the past 3 years. This will take a lot of focus and I am excited to work with other board members to make this a reality. Three other board officer positions were also filled during the December meeting. Donna Wilson will serve as Vice President of the CCAC and focus on sustainability of the organization, community relations and Co-Chair the search committee for future exhibits. Ron McGinniss will continue to serve as treasurer and Jennifer Deitloff as board secretary. The entire CCAC Board of Directors includes, Carol Ann Simon Cillo, Donna Wilson, Karen Elias, Fred Bucheit, Mary Coploff, Jennifer Deitloff, Rich Wykoff, Brady Carnahan, Steven Getz and Ron McGinniss. Student board members include Megan Zick from Lock Haven University and Jeffery Alvarez from Central Mountain High School. Lock Haven’s Downtown shopping season officially starts on Saturday, December 3rd! And, so does an exciting new shopping opportunity! The Clinton County Arts Council’s Station Gallery will hold special “Trunk Show Sales” featuring invited artists on weekends before the holidays. Our invited “Trunk-Show Artists” will be present during special hours for one day only. This is a great time to meet the artist, get special insight into their work and shop the special items they will be bringing for that day. Carol Ann Simon Cillo has recently completed her solo exhibit at the Pajama Factory, and currently is showing works at the Genetti Grille gallery in Williamsport. She will be bringing hand-built works using organic shapes and highly textured or carved and painted surfaces. Ceramic wall-reliefs include contemporary forest landscapes, functional bowls & vessels with unique glaze combinations, and small canvases or ornaments, suitable for holiday gift giving. Deb Stabley is a nationally known ceramic artist whose functional works include whimsically decorated cups, vases, bowls & platters – usually showing elements from nature, like animals and plant life. Deb’s earthenware bowls and platters are hand-built and beautifully decorated with underglazes and glazes, perfect for gifts under the tree, or for use on your own holiday table this season. Bruce Wallace is a photographer who finds beauty, humor and pathos, wherever he points his lens, whether in the Great Smoky Mountains, the beaches and mangroves of Sanibel Island, the streets of New York, Philadelphia or Atlanta, or his adopted home of north central Pennsylvania. Bruce’s primary interests are landscape and street photography and environmental portraiture. Check weekly for additional featured artists! from November 25th to January 8th. So be sure to visit the Station Gallery to browse & shop! The Clinton County Arts Council’s Station Gallery is a Non-profit Organization. A portion of all sales goes towards the programs and continued operation of the gallery. Photo by the Sun Gazette. The original and uniquely beautiful works of Central Pennsylvania artists Dave and Deb Stabley will be showcased at The Station Gallery September 30 through October 23. This show – the fourth of the 2016 Invitational Artist Series – will open with a reception on Friday, September 30 from 6 to 9 p.m. at The Station Gallery, 2 E. Bald Eagle St., Lock Haven – where folks will have an opportunity to get a close up look at the intricate, colorful and evocative ceramic pieces and paintings made by the couple. Deb and Dave have worked full-time as artists since they formed their business, Creative Clay Works, in 1984. For 16 years, they worked out of the studio at their home near Bloomsburg. Over the course of their careers, they have sold their works nationwide through galleries and craft shops on a wholesale basis, as well as in juried gallery shows. They have also participated in numerous arts and craft fairs where they sell their work. In addition, the Stableys have taught many workshops from elementary to university level, are featured in numerous books and magazines and are involved in art activities in their local community, including their membership in Artspace, a cooperative art gallery in Bloomsburg. Deb and Dave have gone through many artistic changes over the years, as they explore and experiment with new directions, according to their website. Recently, their work has focused on clay work. In 2014, the couple opened up The Clay Studio at the Pajama Factory in Williamsport, where they share their own work while encouraging others to express themselves through clay. The Clay Studio is a part of Pajama Factory's nonprofit organization Factory Works, which also encompasses Woodshop, Darkroom and Bicycle Recycle. Both Deb and Dave are employed as art professors at the Pennsylvania College of Technology, Williamsport. Dave, born in Lancaster, earned his Bachelor of Art degree from Millersville University and his Master of Fine Arts degree from the University of Nebraska- Lincoln, focusing on ceramics. His teaching experience includes workshops for elementary through high school students to a graduate assistantship, and being an art school owner and instructor, and more. He has been featured in various publications and earned various awards for his work. Deb was born in Ambler, Pa., and went on to earn her Bachelor of Art degree in art education from Millersville University. She, too, went on to earn a Master’s degree from University of Nebraska-Lincoln, although she studied Curriculum and Instruction. Deb also has taught various art workshops and classes for folks of all ages. She shows her work across the country, largely in the Midwest and Northeast, and has participated in dozens of group shows, from Pennsylvania to Oregon, to Tennessee. She has served as joint coordinator for the Artists’ Studio T our in Bloomsburg, and earned 1st Place- Excellence in Crafts at the Bruce Museum Show, Greenwich, Conn.; 1st in Crafts at the Fine Arts Fiesta, Wilkes-Barre in 2010; and more. Deb and Dave have served as a board members and co-directors for Ceramics Center—the Center for Creativity. Don’t miss a chance to see their work up close and personal, while being able to enjoy light snacks and refreshments and the company of other art admirers from the community Friday, September 30 from 6-9 p.m. Other artists whose work was exhibited this year as part of the 2016 Invitational Artist Series were painters Brienne Brown and Patricia Neely; photographer Steven Rubin and local woodcraftsman Tom Svec. The fifth and final exhibit of the series, which spans parts of October and November, will showcase the works of printmaker Chad Andrews. New Newsletter Format Coming in October! CCAC members, friends and supporters – beginning next month the CCAC’s monthly newsletter, “The Whistle,” and other communications, will be streamlined into a user-friendly, intuitive and interactive email format, where links to more information will be embedded directly inside the beautiful emails! You’re going to love the new system and we’re really excited about the potential it has to bring our members closer and help us learn about what you want from the CCAC. Not to mention the flexibility! You’ll be able to instantly view the CCAC’s newsletters, event announcements and feature articles from your desktop, laptop or mobile phone. 2. Gmail users – consider changing your inbox settings and trade in the “Promotions” and “Social” tabs for a simple, easy-to-use inbox by following these instructions. You can also train Gmail: if a CCAC email goes into the “Promotions” tab, manually drag it to the “Primary” inbox tab, so that Gmail learns that the CCAC’s emails are important to you. you feel you may not be receiving updates after October 1.